My aunt Ginna gave me an in-person tutorial on making those delicious scones properly when she was here for my graduation, and I used that lesson to make them for my mom's birthday. As you may recall, my mom's thing is strawberry shortcake, just like my thing is angel food cake, and my dad's thing is german chocolate anything. -Everything has to be as cold as possible. Using butter right out of the freezer is fine. -Do not take out the cold ingredients until you are about to put them in the dough. -Measure the pastry flour AFTER you've sifted it, because it always puffs up and will throw off the measurement. -Do NOT knead the dough. The less the dough is handled, the better it will turn out. -When you're ready to plop the dough onto the parchment-lined baking pan, use a measuring cup and dip it in hot water in between scoops. 1. Sift flour, baking powder, salt and sugar into the the bowl of a huge food processor. Add butter chunks and process for no longer than 1 minute. It should feel like coarse meal. 2. In a separate bowl, beat eggs, heavy cream and sour cream. Stir in vanilla bean paste. Add mixture to food processor and mix. You're not looking for a soft ball, really. The dough is more batter-y than dough-y. DO NOT OVERMIX! Stop once the ingredients have come together. 3. Scoop out dough (I used 1/4 and 1/3 measuring cups) and plop onto a baking pan lined with parchment paper. Sprinkle the tops with sugar. 4. Bake at 350 degrees for ~20 minutes, until they are golden. Mix 2-3 lbs of strawberries (washed, hulled and cut in halves and quarters) with some sugar (up to you, depending on how sweet you want them). Let them sit for an hour or two to draw out the juices. Beat leftover heavy whipping cream and 1 tbsp powdered sugar with a whisk until stiff peaks form. 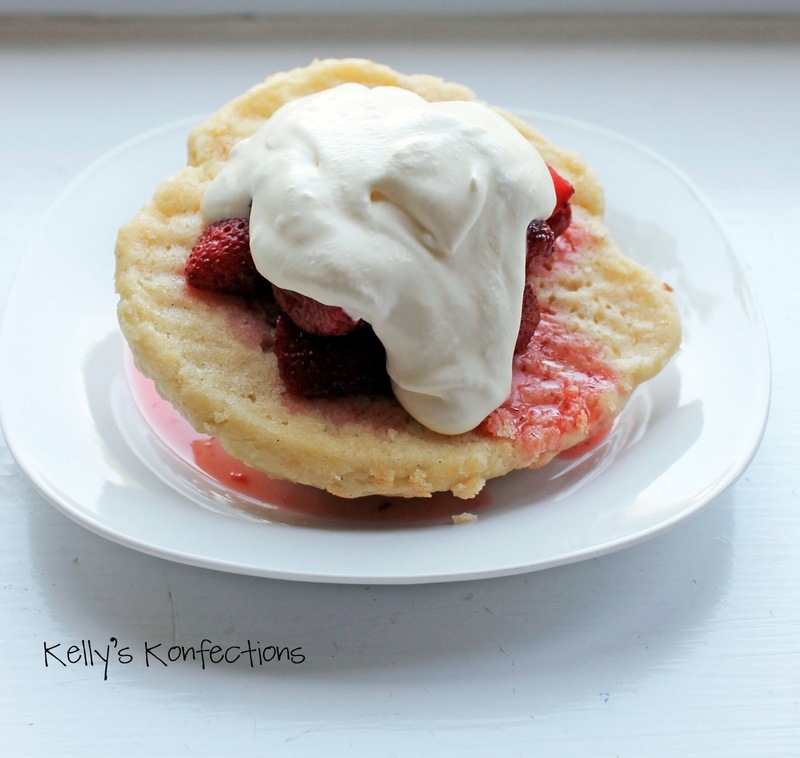 Spoon the strawberries (generously) onto the cooled scones, then dollop some whipped cream on top.